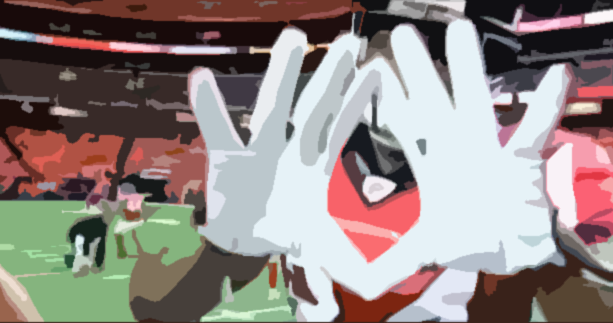 Reliability is a critical aspect of a competitive fantasy football roster. Just as we did for running backs, we have produced the Rosterwatch Fantasy WR Reliability Ratings. 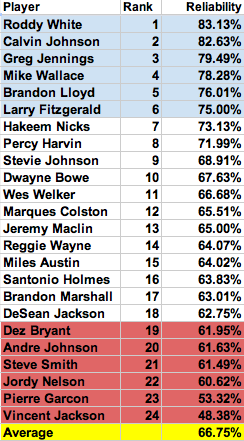 These ratings are derived from the last two years of production and consist of Fantasy WRs expected to be starters. The numbers are fluid and will change under varying circumstances in 2012, but this examination provides a current baseline to which your future expectations can be applied. 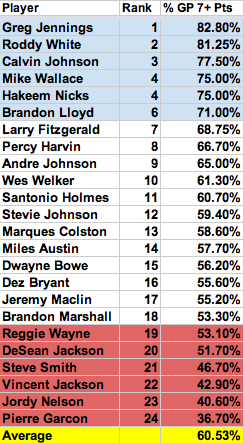 The data comes from Mike Loyko’s Two-Year Master Study on WR Points Distribution. 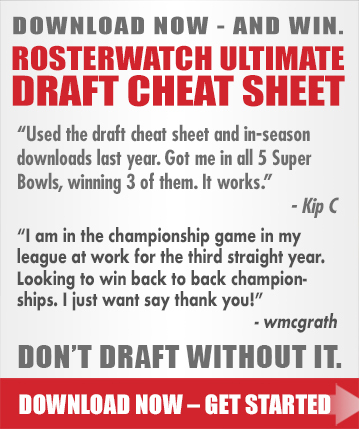 A comprehensive WR analysis that I recommend you also read. The reliability ratings tell us most about a player’s fantasy floor. We are looking at % of games missed, % of games when a player scores at least 7 points, and % of games when a player scores at least 10 points. All very important information when you are deciding how to allocate your draft picks, especially throughout the top half of your draft. 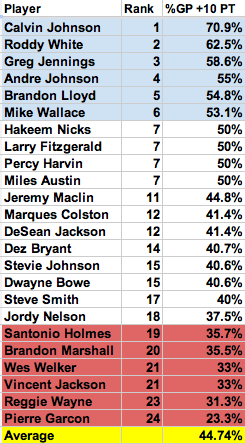 Roddy White obviously doesn’t have the upside of Calvin Johnson but he has been every bit as reliable. His status could change some as Julio Jones continues to evolve but White’s early draft status is clearly justified. Calvin Johnson is such a threatening fantasy football weapon, scoring over 10+ pts. more than 7 out of 10 times. (Many times it’s way over 10 points). If it always felt like Greg Jennings was super consistent, it’s true he is. Andre Johnson continues to be overrated. He is way too unreliable to consistently elicit the 1st, 2nd, or 3rd round draft picks used on him, year after year. It’s shocking that he has never scored double digit TDs in a season and his career average is less than 6 TD/season. Mike Wallace is exceptionally reliable for a big play guy that you expect to be much more hit or miss. A great blend of reliability and explosive upside. Hopefully he doesn’t sabotage himself with this holdout. Brandon Lloyd, aka “Spiderman” at RosterWatch, is extremely reliable. Even though there are a lot of mouths to feed in New England, you have to think things will only get better playing with Tom Brady. A great draft value. Wes Welker is less reliable than you would think. Jordy Nelson has been pretty boom or bust. Expect that to continue to improve. Larry Fitzgerald is slightly overvalued in drafts. He’s got just above average reliability, primarily due to the QBs he plays with. That hasn’t changed though. Percy Harvin is sneaky reliable for a big play guy. A great fantasy option especially if your league awards points for special teams production. The Cowboys have a pair of fairly unreliable fantasy WRs. Both would make much better #2 WRs but the draft is unlikely to play out that way. I’d still rather have Jeremy Maclin than DeSean Jackson . Don’t let Steve Smith’s early season production last year fool you. He faded down the stretch. I like him this year but do not over-draft him. I like the pre-season connection between Pierre Garcon and RG3. Garcon’s poor reliability ratings temper those feelings a bit. He will be featured in Washington, but another year of transition isn’t the best for reliability. Vincent Jackson is terribly unreliable. I’m not sure how going from Philip Rivers to Josh Freeman helps that. Brandon Marshall has big expectations this year for being so low on the reliability scale. All the circumstances indicate a return to elite status now that he is in Chicago. I’d still like to make sure I get the proper draft value on him. 1200 yd and 10 TD seems pretty likely in 2012. 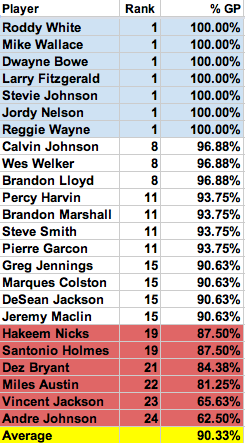 Hakeem Nicks is a really nice player. He represents very fair value in the draft. In the very first sentence of this article, there is a link to the same report for RBs. QBs will be coming out soon as well. Thanks for the read and the gracious note. Enjoy and come back!